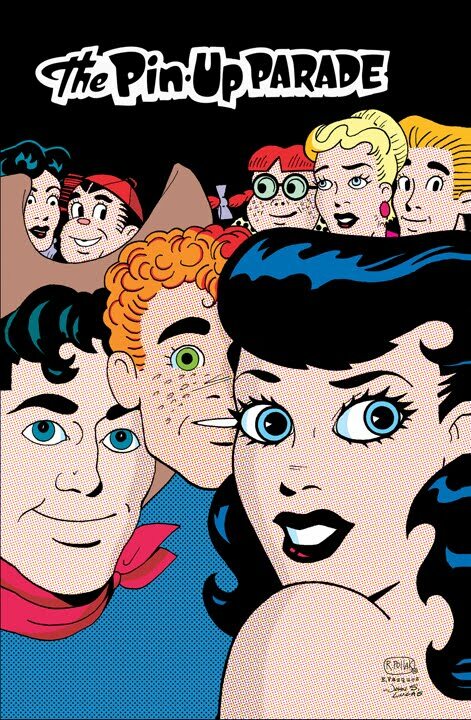 Original cover is by Bill Woggon; Archie Comics 1959. R. Robert Pollak's website is here. Late! Holidays are messing me up! Oh yes, Edwin Vazquez did the color and John S. Lucas did the logo design. The original artist on this was Bill Woggon, Katy's creator, in 1959 with some help from one of his assistants Cassie Bill. 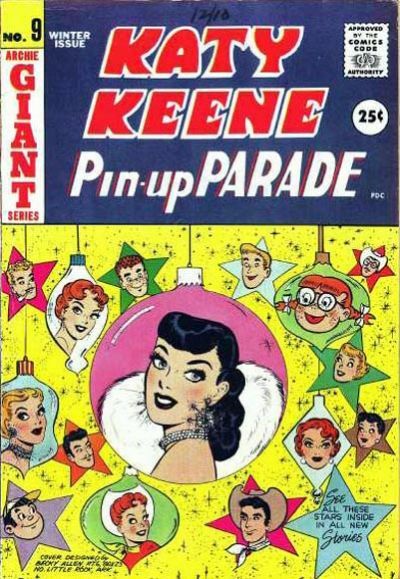 Bill's caricature of himself is in the top right Christmas star ornament where he's wearing a cowboy hat. Top left shows Danny O'Connell, Katy's agent and executive at Colossal Studios; Tammy Terry, Danny's secretary and later wife; and K. O. Kelly, one of Katy's boyfriends who's a boxer; top right shows blond wealthy Randy Van Ronson, one of Katy's boyfriends; Sis, the Candy Kid and Katy's little sister in orange pigtails; Woggon (cowboy hat); Debbie Twist, Katy's next door teenaged neighbor (in green star); Bertha Bumples in brown star, Katy's other next door neighbor and best friend; Lucki Red Lorelei in the diamond ornament and red short hair, one of Katy's friends; and in the bottom right star, cowboy Curly Cassidy, rancher boyfriend of Katy and sometime actor; to the bottom left of Katy (center, of course) we find blond wealthy Gloria Grandbilt, cousin of Randy and Katy's rival; between Gloria and Katy is found Errol Swoon, Movie actor and one of Katy's beaus; bottom left corner is Chubby Chuckles, owner of Chubby's Sweet Shop and Katy boyfriend wannabee - and to the right of him is tomboy cowgirl Gigi Grandbilt, Gloria's cousin and who has a major crush on Curly Cassidy ! Thanks - from Katy Keene Artist, John Sterling Lucas. right cover is art done by R. Robert Pollak of NYC for the PinUp Parade and includes some of Katy's original gang members - thanks, John Sterling Lucas. John-You certainly know all the characters and history! Thanks!